Discrimination is the act to differentiate and separate. It enables us to classify information and to learn easier, however it can also act as a tool for us to set people apart from one another in order to maintain the power structures of the society and protect our privileges. Being a recognisable social stressor that can adversely affect the health and wellbeing of individuals, the topic and context of discrimination should be addressed in the curriculum so that future healthcare professionals are able to recognise and battle discrimination and provide dignified healthcare for all. 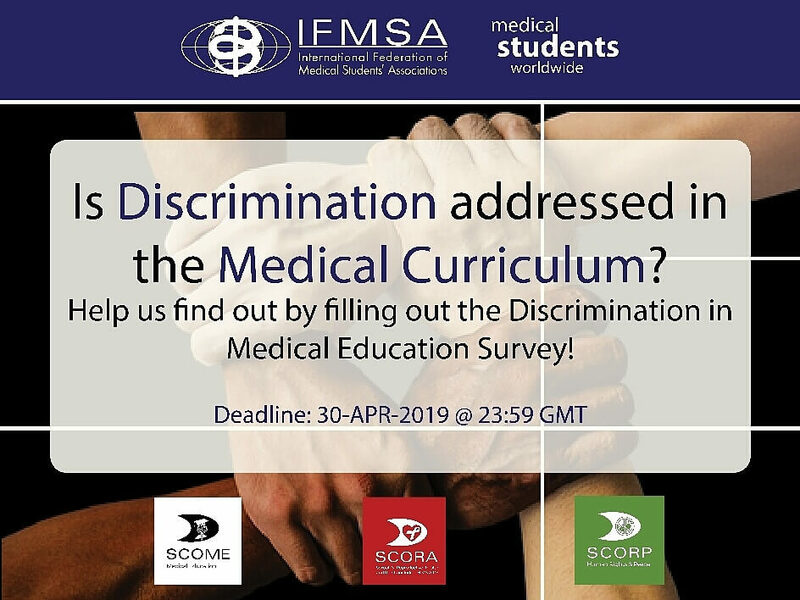 With this survey, IFMSA aims to understand how Medical Education is addressing discrimination and its implications in healthcare and preparing the future health workforce. The assessment is divided in two parts in order to understand the curricular structure, as well as students’ perspective regarding the approaches to discrimination in Medical Education. Our members’ collaboration is invaluable as to understand the current situation worldwide and how medical students can lead the change towards a better education and healthcare professionals. The form takes approximately 10 minutes to fill out and will be available until April 30th.